Seventh Grade English focuses on the theme of the hero and the hero's journey. Among the works often read are True Grit, The Odyssey, and To Kill a Mockingbird. Boys learn the skills to read and write about literature critically, including reading closely, annotating, and the T.E.X.A.S. paragraph. Boys also write often for personal expression in a variety of ways, including both formal essays and blogs. Language Fundamentals focuses vocabulary study on roots and affixes, and the skills for using those as one encounters unfamiliar words. All boys participate in a speech contest in the spring. Boys study grammar focusing on minimizing errors in Standard Written English in one’s writing. Topics often taken up include parts of speech, clauses and phrases, and basic punctuation, especially with commas and quotation marks. Eighth Grade English is a multilayered course through which students develop skills to analyze complex literature, to write both analytical and creative pieces, and to enhance vocabulary by acquiring usable knowledge about Latin and Greek roots. The theme of self in relation to other individuals, to the community, and to the larger world is explored through the study of various short stories, novels, plays, and poems. Students learn to ask essential questions of the literature and, consequently, of themselves and each other. Frequent class discussions, reflective writing assignments, and various kinds of group work and projects serve to engage students with the literature and with each other. Some of the texts studied are Shakespeare’s Romeo and Juliet, Steinbeck’s Of Mice and Men, Knowles’s A Separate Peace, Wolff’s This Boy’s Life, Achebe’s Things Fall Apart, and Cisneros’s House On Mango Street. Ninth Grade English focuses on the theme of the individual and society. The literature we read focuses on how both individuals and groups create and maintain their identities. Among the works often read are American Born Chinese, Inherit the Wind, Lord of the Flies, and selections from the Hebrew Bible and the New Testament. We also focus on how to produce and consume stories and arguments. Students read both with an eye to understanding how they work and practice both creating and using what they have learned from models. The year begins with a unit on the personal essay and moves in the second term to focusing on persuasive and analytical writing. Boys write essays weekly, extensively using the 6+1 Framework for assessing writing. Grammar is taught both inductively and prescriptively, and focuses on minimizing errors in Standard Written English in one’s writing. Language Fundamentals focuses vocabulary study on roots and affixes, and the skills for using those as one encounters unfamiliar words. All boys participate in a speech contest in the spring. Seventh Grade American History begins after the Civil War and extends well into the twentieth century. There is an attempt to balance the teaching of content with that of skills and there is a heavy emphasis on reading for meaning, note taking, outlining, researching skills, analyzing primary sources, writing paragraphs, writing to persuade, preparation for assessments, analyzing maps, charts and the like, and using technology. The approach to content is thematic and during the fall term students take up post-Civil War industrialization, urbanization, and immigration, and end the term with 19th and early 20th century reform movements. In the winter the study is American foreign involvement - expansion into Latin America and Asia, World War I, and World War II. The spring term is devoted to a study of African American history, starting with Reconstruction, moving on to segregation and "Jim Crow" laws, and ending with the Civil Rights Movement. Eighth Grade Ancient World History examines the story of the civilizations that emerged in China, Sub-Saharan Africa and the Middle East. A trimester is devoted to each region as we explore the histories, the culture, and the belief systems that developed early in time. Historical fiction is used to highlight many of the important concepts that we study. We end each unit with a research assignment that encourages the boys to look at each of the regions in more modern times. There is an attempt to balance the teaching of content with that of skills. The boys continue to learn to read with more purpose, use a variety of note taking skills, argue persuasively in both written and oral form, prepare for assessments, think analytically and acquire the research skills to construct a final thesis paper. The focus in Ninth Grade is the study of world history through current events. As such, the content of the course is determined by the times. However, there are certain themes that persist - geography, nationalism, imperialism, and revolution. Through this study, we consider various historical elements and factors, including: political, economic, religious, social, intellectual/artistic, technological. Ninth Grade History is a skill intensive course, where boys develop the ability to read critically, write persuasively, speak articulately, research effectively, and think analytically. In the spring term, ninth graders participate in an inter-disciplinary program of study called "Facing History & Ourselves." As stated on the Facing History website, "By integrating the study of history and literature with ethical decision making and innovative teaching strategies, our program promotes students’ historical understanding, critical thinking, and social-emotional learning. As students explore the complexities of history, they reflect on the choices they confront today and consider how they can make a difference." 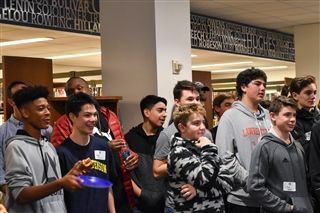 At Allen-Stevenson, ninth grade boys select an individual ethical issue to explore through research, reading and art, and which culminates in a formal presentation of their topic and art piece to faculty and visitors. The Pre-Algebra course focuses on the study of rational numbers, order of operations, laws of exponents, variables, expressions, and equations. Students solve and graph equations and inequalities, write and solve proportions, and explore geometry, statistics, and probability. Many problem-solving strategies are emphasized throughout the course. By the end of the course students have the foundation for success in Algebra I. The Algebra I curriculum includes the study of linear equations and inequalities, exponents and exponential functions, polynomials and factoring, quadratic functions, irrational numbers, and radical expressions and equations. Plane geometry concepts are applied and extended. In Geometry, students develop critical thinking skills through the use of logical argument and proof. They learn definitions, postulates, theorems, and corollaries and use these to explain the relationships that exist among lines, angles, triangles, and other two-dimensional figures and their solid counterparts in space. They work with the foundations of deductive reasoning to write paragraph, flow, and 2-column proofs. They study coordinate geometry, trigonometry, and similarity and become involved in an in-depth analysis of perimeter, area, volume, and surface area. A look at mathematicians and the history of math adds special enrichment to the course and math labs that link concepts studied to applications in real-life are completed using the software of Geometer’s Sketchpad and Excel. Seventh Grade Science is a course in life science. We begin the year with a study of the functions of living things and then move forward by examining cells, diffusion, classification, bacteria, and viruses. Our main tool during this portion of the course is the microscope, and the boys develop a complete set of skills while using this piece of equipment. The year continues with our study of evolution by visiting The American Museum of Natural History. The boys examine all aspects of this topic using the inquiry approach to education. A genetics experiment, lasting from September to January using Wisconsin Fast Plants, is used to segue into our study of heredity. Boys study plant structure and function as part of this unit and use the data to develop the basic laws of genetics. They refine their skills of data collection, measurement, observation, problem solving, and drawing conclusions throughout this experiment. The year continues with a unit about the human body in which we study the reproductive, digestive, circulatory, and respiratory systems. The boys are required to do a science project at the end of the year. The Eighth Grade Physical Science course covers Newtonian motion and basic chemistry. In the fall, the boys learn about one and two-dimensional motion, learning how objects accelerate and interact with each other. Experiments include calculating each boy’s kickball velocity and predicting the landing spot for a launched projectile. In Chemistry, the boys learn about synthesis, decomposition, single replacement and double replacement reactions. Chemistry labs include identifying mystery elements based off their properties and predicting the amount of salt produced in an acid-base neutralization. The Biology course begins with a review of life functions, cells and a refinement of their microscope skills. The boys also learn how to measure the size of objects seen under the microscope. The major unit during the fall is the study of biochemistry. The boys examine the structure and function of carbohydrates, lipids, proteins, and nucleic acids. They develop an understanding of how these organic chemicals are broken down and used in the body. Further study includes work on enzymes and cellular respiration during which the boys learn how various proteins help control the body and how energy is produced, stored, and used in the cells. The next unit, mitosis and meiosis, helps build the foundation for our study of genetics. Here we study additional types of inheritance, building on what was covered in seventh grade life science. The boys use Wisconsin Fast Plants to carry out another four month long genetics experiment utilizing the collected data to develop additional concepts about heredity. The biology class takes up the study of DNA profiles and does an electrophoresis lab with bacterial DNA. The course draws to a close with the study of human systems not covered in seventh grade. These include the human excretory, muscular, skeletal, and nervous systems. The boys are required to do a science project at the end of the year. 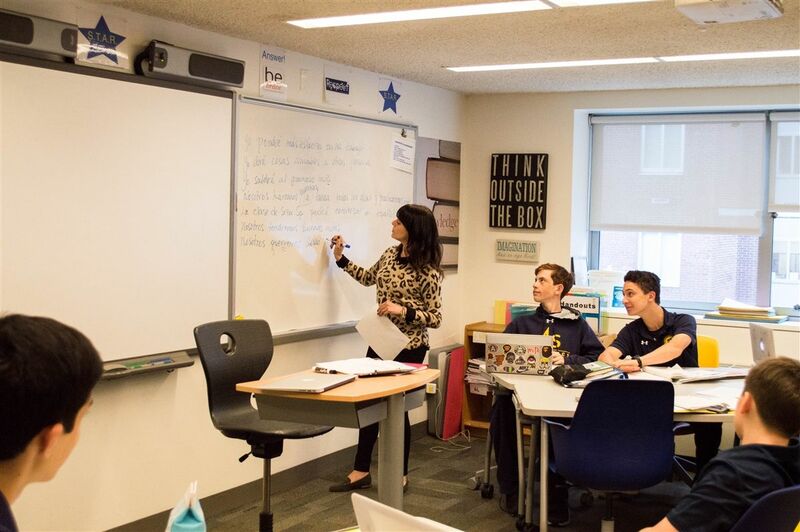 In Seventh Grade Spanish the boys expand both writing and speaking skills by learning and using the present progressive, immediate future, and preterite tenses. They apply their knowledge across the speaking, reading, writing and listening modalities. Boys have a journal and are encouraged to free write in order to delve deeper into their writing without the structure of being graded based on grammar. They build on their previous grammatical knowledge and increase their vocabulary. They will enter the eighth grade ready to use authentic communication. For the first time, boys read a short mystery reader and strengthen their ability to parse out words to understand greater context, to go back into a text to find relevant information, and to make inferences based off of what they have read. Each unit is accompanied by a creative project allowing the boys to enhance their interpersonal, interpretive, and presentational modes of authentic communication. In Eighth Grade, there is tremendous emphasis on grammar as we prepare the boys for high school Spanish. Both the indicative and subjunctive modes are explored and boys can comfortably distinguish between verb tenses. Much greater emphasis is placed on literature and poetry, predominately that of the great writers such as Gabriel García Marquéz and Pablo Neruda to name a few. Much of the work is done through project-based units, and the boys’ expertise in technology is put to good use making sophisticated presentations using a variety of technology. Every other week at least one class is devoted to conversation where the boys are assigned as discussion facilitators who must lead their peers in Spanish-only conversation for a sustained amount of time. In the beginning of the year topics are simple such as weekend plans and sports, but by the end of the year boys are encouraged to discuss social justice issues around the Spanish-speaking world and close to home. 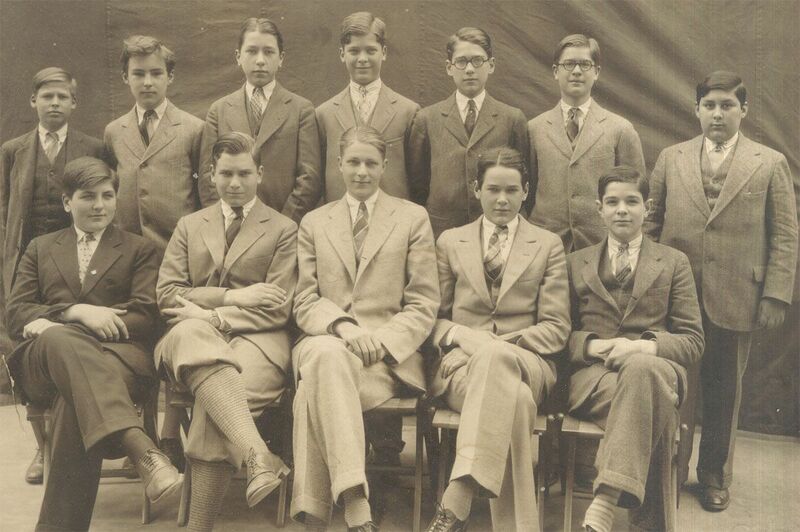 Boys enter the Ninth Grade having been exposed to the main verb tenses: present, present progressive, preterite, imperfect, conditional, future, present perfect, and subjunctive as well as other important grammatical concepts. In line with their Facing History curriculum, emphasis is now placed on social justice learning, focusing on immigration and connections to the world around them. The unit begins with a book called “El Canto de la Paloma” and moves towards the Cesar Chavez movement. The boys are then asked to analyze the film, “A Better Life,” which is directed by an Allen-Stevenson alumnus. Through discussion, writing, and reading, the boys delve deeper into the impact of immigration. The topic is brought closer to home as the boys watch a documentary called “Inocente,” chronicling the life of an undocumented teenage girl in California. Through that the boys decide to focus on homelessness amongst undocumented children in the US and the importance of the arts in education. In addition to the immigration unit, boys read the next level of the mystery reader they read in Seventh and Eighth Grade and create movie trailers for the novel. There is much flexibility in the curriculum to allow for current events and deeper discussions. Study Skills continues to build on skills learned in Middle School. The study skills teacher works with subject teachers to deepen necessary skills, which help our students to become independent learners. Some skills and topics include annotating a text, test taking strategies, developing study guides for different subjects, writing strategies, such as outlining or other graphic organizers, as well as organization and time management skills. Study Skills is a test prep course for the verbal portion of the SSAT and ISEE. Within the class the students will learn test taking and time management strategies for the reading comprehension, analogy, synonym, and vocabulary sections of the test. In addition, the students will learn how to write a well-organized essay for the written portion if the tests. Further, the students will continue to learn organization practices using technology in order to stay on top of their schoolwork. We continue with the digital fluency curriculum, focusing on positive aspects of developing and participating in digital communities and establishing a positive digital footprint. Our emphasis on Digital Citizenship is further strengthened with an emphasis on computer science and the actual function of the Internet and computers so that boys will have a true understanding of the way that these things enrich our lives. Eighth Grade technology is presented in both an integrated manner within subject classes and offered through a rich selection of technology-based electives. Skills are taught in conjunction with subject teachers so that they help students accomplish goals in their subject classes. 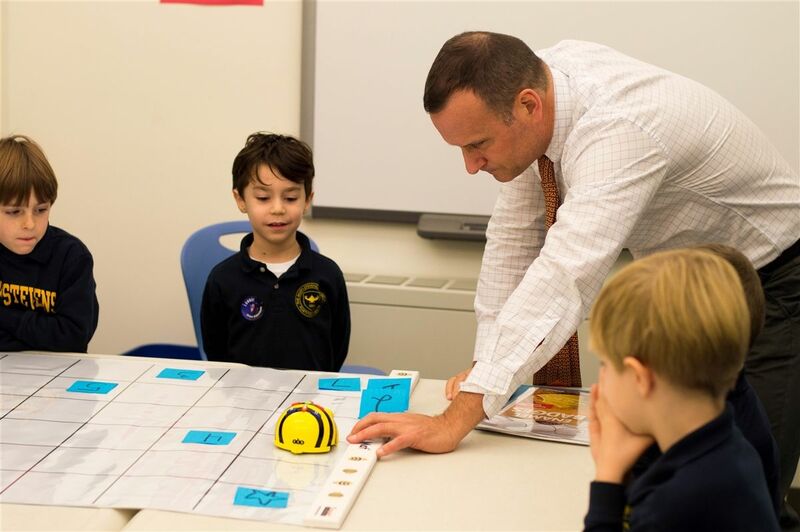 Our elective offerings, ranging from advanced coding, and robotics, to graphic design and digital tinkering, allow students of all skill and interest levels to explore the areas of technology that fit their own proclivities. We revisit the Digital Fluency curriculum that we explored in earlier grades emphasizing topics that will help students as they enter adulthood. Students continue with our elective and integration program. There is also large technology component in the Ninth Grade Facing History project that allows students to work independently with teachers in art and technology to complete a project of their own devising. We encourage the boys to expand their reading horizons, experimenting with new genres and challenging themselves with more complex texts, both fiction and nonfiction. As they become more sophisticated readers, they learn to pinpoint the appeal elements in books and how to use these to connect with other readers. Just as we foster intellectually curious and ambitious readers, we prepare our boys to inquire and think critically when pursuing research goals. In the context of cross-curricular, collaborative projects, we teach them how to locate, evaluate and cite sources, as well as how to ask meaningful questions and draw conclusions with the goal of creating new knowledge and innovative solutions. Research topics include immigration, urbanization, reform, World War II and Plessy v. Brown. As members of a highly networked society, we emphasize digital citizenship, understanding media messages, and the importance of learning to use the Internet to foster self-learning and connect with the world. We encourage the boys to keep reading and challenging themselves as readers, despite the many demands on their time. As they become more sophisticated readers, they learn to pinpoint the appeal elements in books and how to use these to connect with other readers. Just as we foster intellectually curious and ambitious readers, we prepare our boys to inquire and think critically when pursuing research goals. In the context of cross-curricular, collaborative projects, we teach them how to locate, evaluate and cite sources, as well as how to ask meaningful questions and draw conclusions with the goal of creating new knowledge and innovative solutions. At this grade level boys are expected to generate thesis questions and to use parenthetical citations to support arguments and avoid plagiarism. Research studies include the Mao Zedong, South Africa and Iran-Iraq. As members of a highly networked society, we emphasize digital citizenship, understanding media messages, and the importance of learning to use the Internet to foster self-learning and connect with the world. We encourage the boys to keep reading and challenging themselves as readers, despite the many demands on their time. As they become more sophisticated readers, they learn to pinpoint the appeal elements in books and how to use these to connect with other readers. Just as we foster intellectually curious and ambitious readers, we prepare our boys to inquire and think critically when pursuing research goals. In the context of cross-curricular, collaborative projects, we teach them how to locate, evaluate and cite sources, as well as how to ask meaningful questions and draw conclusions with the goal of creating new knowledge and innovative solutions. As members of a highly networked society, we emphasize digital citizenship, understanding media messages, and the importance of learning to use the Internet to foster self-learning and connect with the world. In Seventh and Eighth Grades, the boys rotate the following courses on a trimester basis. Boys spend most of the trimester developing their skill with portraiture. We look at the work of contemporary portrait artists and explore lights and darks on the face with a series of drawings using oil pastels, and black and white charcoal pencils. We explore proportion, discussed underlying bone and tissue structure, and use mirrors to examine the face and draw from life. Boys work on paper and canvas, and create 3-D faces using cardboard. We end the semester by exploring different painting techniques highlighting basic compositional elements such as line, space, texture, and color. In Computer Art, students learn to manipulate, alter and transform photographs and images using the Adobe PhotoShop program. Projects require the use of different tools in the program to create original work illustrating specific art concepts and processes. The first project focuses on examining architecture and fusing buildings together as a way of learning the various tools in Photoshop. For their second project, the boys explore a futuristic world around the theme of Utopia/Dystopia. The Film and Media course focuses on the genre of monster and horror films. Students create 1 to 3 minute films that range from psychological horror to science fiction. Students look at both historical and contemporary clips, including the famous Frankenstein of 1931 with Boris Karloff, and "The Blob" made in 1958, as well as several short horror films including the famous "Down to the Cellar" by Czech filmmaker Jan Svankmajer. We discuss the role of the monster in these films and monsters as metaphors. In addition, we discuss the elements that build suspense within a film. The boys work in groups of 3 or 4, writing storyboards, acting, filming and editing. Boys in the Woodshop class create wooden sculptures of robots inspired by the artist, Nam June Paik. They view work from the exhibition at the Asia Society entitled, "Becoming Robot," and work either independently or in small groups. Woodshop meets once a week. This class examines the material, social, and political dimensions of cultural practices. Through the process of research and discussion, the boys are introduced to the means by which cultural objects and communities are produced, the historical contexts in which they emerge, and the modes of social interaction to which they contribute. This trimester the boys focus on Facing History and Ourselves. Music is an integral part of every boy's education at Allen-Stevenson. All boys have the opportunity to sing, to play a musical instrument and to perform in musical ensembles. Musical activities range from classroom music, which includes singing, playing Orff instruments and recorders, to private study of orchestral instruments, all of which lay the basics for Chorus, Orchestra and Upper School Electives. 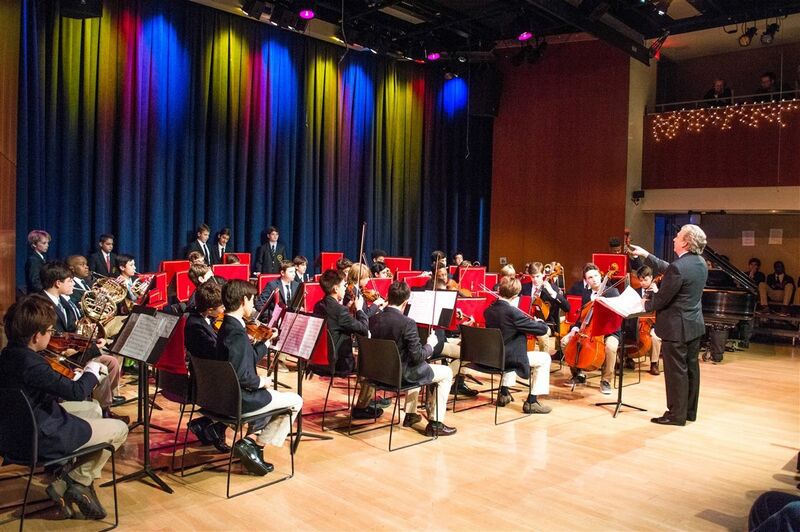 Through classwork, field trips, and performances, Allen-Stevenson boys acquire practical training in music and develop a well-rounded appreciation and understanding of music. Various technologies are incorporated to support and enhance student learning. Allen-Stevenson hosts two Orchestras for grades five through nine and two preparatory ensembles in grades 3 and 4. Instruments are introduced in the classroom, age-appropriately, with contextual storytelling, music-listening and fundamental theory and history. A group of performing professionals, who are instructors at the School, teaches private lessons during the day, rotating some 200 students through the academic day. The instructors work with students towards studio recitals, instrumental assemblies and orchestral performances. Membership in the orchestras is determined by both social and technical levels of advancement, leaning currently toward preserving the grade-level social dynamic. The highest level, known as the senior Philharmonia, tours on alternate years, with city outings such as Broadway, or off-Broadway shows, or other cultural events. Past trips out of town have included Yale, Princeton, Philadelphia, Mystic Seaport, Providence and Six Flags, usually integrating recreation, sport, and history together with community service and the mission of music. Currently at Allen-Stevenson, over 200 boys are taking private lessons, with more than 120 boys involved in ensembles during the week. Allen-Stevenson hosts two Choruses in grades five through nine. Vocal technique is begun in the classroom, age-appropriately, with songs from many cultures. Basic work on pitch matching as well as sight singing is also part of the classroom music experience. Chorus rehearsals take place in the early morning before school as well as during the body of the school day. Since 1990, the Allen-Stevenson School Choruses have established themselves as first-rate choral ensembles, performing at the White House, the Kennedy Center, Carnegie Hall and for many organizations throughout New York City. Professional engagements have included performances of the St. Nicolas Cantata by Benjamin Britten and Carl Orff’s Carmina Burana, both with the Musica Viva Chorus of New York City. Seventh grade boys have two opportunities for stage performance. In the winter, boys are eligible to participate in the school’s main stage Gilbert & Sullivan production, which includes grades 5 to 9. Students in Seventh Grade may audition for a leading role or they may opt to participate in the chorus. For this show, students work with several professional theatre, music and dance faculty members and participate in a professionally run rehearsal process. In the spring, students may audition for and perform in a non-musical play with girls from The Nightingale-Bamford School. This production is led by Theatre Department faculty and takes place at Allen-Stevenson. Along with the performance opportunities, there are two theatre electives offered each trimester. In addition to all of these performance opportunities, students are eligible to participate in the school’s technical theatre program where students learn to design the lighting, sets, costumes, sound, and props, and they can become top-notch stage managers. Students in the technical theatre program run all technical aspects of the production during all performances. This is a truly unique opportunity for middle school students, not found in very many middle schools. In autumn, eighth grade boys may audition for and perform in the school’s annual Shakespeare production, which is produced with girls from The Nightingale-Bamford School. This production is led by theatre department faculty and takes place at Allen-Stevenson. In addition, eighth graders may audition for and perform in the school’s annual Gilbert & Sullivan production. Students may audition for a leading role or they may opt to participate in the chorus. For this show, students work with several professional theatre, music and dance faculty members, and participate in a professionally run rehearsal process. Along with the performance opportunities, there are two theatre electives offered each trimester. In addition to all of these performance opportunities, students are eligible to participate in the school’s technical theatre program where students learn to design the lighting, sets, costumes, sound, props, and they can become top-notch stage managers. Students in the technical theatre program run all technical aspects of the production during all performances. This is a truly unique opportunity for middle school students, not found in very many middle schools. In autumn, ninth grade boys may audition for and perform in the school’s annual Shakespeare production, which is produced with girls from The Nightingale-Bamford School. This production is led by theatre department faculty and takes place at Allen-Stevenson. In addition, ninth graders may audition for and perform in the school’s annual Gilbert & Sullivan production. Students may audition for a leading role or they may opt to participate in the chorus. For this show, students work with several professional theatre, music and dance faculty members, and participate in a professionally run rehearsal process. Along with the performance opportunities, there are two theatre electives offered each trimester. On March 8, the Middle and Upper School boys learned about Denmark’s role in helping the Jewish people during World War II from Ambassador Anne Riggelsen, Consul General of Denmark, whose visit was made possible by an organization called Thanks to Scandinavia. This organization offers scholarships to Scandinavian students to study in Israel or the US in honor of the rescue of Danish Jews during World War II.